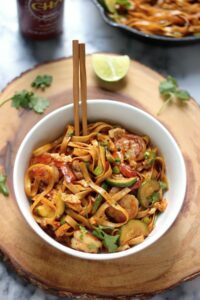 An easy recipe for 20-Minute Spicy Sriracha Shrimp and Zucchini Lo Mein! This quick and family friendly dinner recipe is sure to be a hit in your home! And the leftovers are even better the next day. This colorful noodle dish is seriously a lazy cooks DREAM! It comes together so fast and effortlessly, and let’s be real, sometimes we all just need a quick, tasty, noodle dish – right?! I added charred zucchini for a veggie kick (and because we’re already swimming in it), but I have a hankering you could really add any veggie you want. I also added spicy little shrimps because, well, because they’re super delish and take 2 minutes to cook. YES!!! You could probably add chicken or beef, too, but keep in mind they would take longer to cook. While waiting for the water to boil, prepare the spicy sriracha sauce. In a small bowl stir together the brown sugar, soy sauce, sriracha, ginger, and sesame oil. In a large skillet melt 1 tablespoon of butter over medium-low heat. Add the crushed red pepper to the butter, and once it's completely melted whisk in the eggs. Stir gently and cook for about 3 minutes. Once the egg is done cooking, keep the pan on the burner but transfer eggs to a small plate; set aside. Add 1 tablespoon of oil to the pan and increase the heat to medium-high. Add shrimp and cook for 2 minutes on each side, or just until firm and bright pink. Remove with a slotted spoon and transfer to a clean plate; set aside. Add zucchini to the pan, increase heat to high, and remaining oil; stir fry until just charred; about 3 minutes. Stir in garlic and cook for one minute. 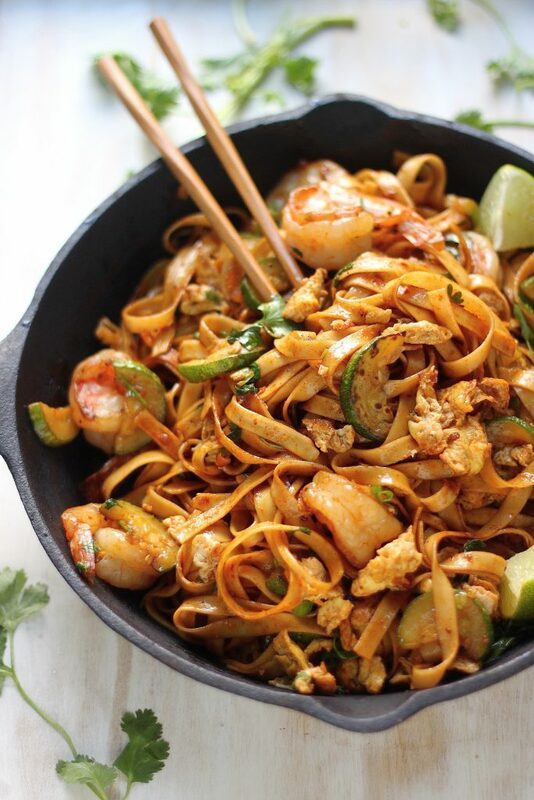 Add drained noodles to the skillet along with the cooked egg, shrimp, and prepared sauce. Turn the heat on to medium-low, and stir until everything is coated well with the sauce. Sprinkle the sliced green onions and cilantro and serve at once! This dish was amazing I added some peanuts just for an extra crunch and it was super tasty ☺️ Thanks for the amazing recipe! This lo mien looks amazing! Pinned for dinner this week! Hubs is out of town which means I can stuff my face with noodles for dinner with no one asking, “where the real dinner is?” !!! Hooray! I wouldn’t call this recipe lazy! I was so stressed making this!! Maybe on my 2nd try it’ll be better. It was very good though even though I didn’t have any brown sugar ginger or awesome oil! This is the BEST BEST Asian noodle bowl I’ve ever had. My husband loves it. I try not to make it every week so as to avoid burnout. But I don’t think we ever would! Ditto, never met a noodle I didn’t like! Love this! This looks sooooo good! I have an open packet of Asian noodles that are just begging to be used. I bet they’d be perfect for this. Your recipe looks amazing. I accidentally bought cooked shrimp do you think that would work and how would I add it to the recipe? This is such a gorgeous dish! I started craving it the moment I saw it. I have been on a shrimp kick lately mainly because of how fast and easy it is to cook. This is definitely getting made while my garden veggies are in full swing! Thank you, Courtney! I love shrimp too – and for the same reasons 🙂 I hope you love this spicy noodle dish as much as we did! Made this for dinner tonight. I used chicken instead of shrimp because my husband does not like shrimp and it was delicious! Will definitely make this again. Maybe next time I will try using shrimp. Made this for dinner tonight for myself and my boyfriend – it was a hit! Restaurant quality! Great recipe and quick – lived up to the 20 minutes implied in its name. I will definitely be making this again soon! I’m a sucker for Lo Mein. . love this stuff. . yours looks amazing!!! Pinned and definitely am trying! This recipe sounds lovely, can’t wait to make it! One question though–I’m not a huge fan of cilantro, would you recommend substituting something else instead? Hi Lauren! You could sub in some basil 🙂 or even parsley. Made this for me & the bf tonight. We loved it! Used fettuccini noodles & went a little easy on the siracha. Already dreaming about lunch tomorrow because I’m taking leftovers. I just made this for our Sunday supper and it was absolutely delicious! I love loved this recipe definitely making again and again thanks . And it’s so easy ! This dish is fantastic! Instead of zucchini I subtituted broccoli, peppers and mushrooms. My husband loved it and can’t wait to make again. Thanks for recipe! My hubby and I are recently married. I made this for dinner one night and its his favorite recipe so far. We made it for my parents when they came to visit and they loved it and now my mom makes it for my dad 🙂 thanks for the recipe! This looks amazing! !Loving all the flavors here! Just made this for dinner tonight and it was delicious! I am for sure saving this recipe and making again. I can’t wait to try those dumplings next! Thanks for the great recipe! Hi Mia! So happy you enjoyed the recipe! We love this lo mein, too 🙂 Good luck with the dumplings! Another favorite of ours. We had this for dinner tonight and it was brilliant! So quick to whip up, it really is only 20 minutes, the time to boil and cook the pasta. I was absolutely delicious. I used the measures for the spices but did generous Ts and it was spicy in a way we love. I also used fettucini noodles that look like your picture and the dish is really reminiscent of spicy pad thai, which we also love. We were short on the shrimp but had some baked toful we needed to use up and used the cominbation and it worked great. The winner for this recipe is the sauce and the egg. 🙂 This is a new fave for sure. Thanks so much! All in all, this was a very filling and pretty dish that was as spicy as advertised and required a fair amount of prep.. I had to double everything because I had a pound of shrimp to use up, but thank God I didn’t double the sriracha. I only used 2 TB for the entire dish, so it was a pleasant burn that teetered on becoming not-so-pleasant. I fear the dish would have been inedible if I had doubled the sriracha, too. The prep time took longer than 20 minutes. The actual cooking took about that long, maybe 25. But five more minutes is no big deal. The dish dirtied a few plates and stuff as well. Hi Marsha. I’m glad you enjoyed the dish. Doubling the recipe would definitely add to its overall prep/cook time. This recipe has quickly become a family favorite. In a rush I bought some Pad Thai yesterday but I’m going to add your zucchini idea to it as well. I will also add them to my Shrimp Scampi recipe for more color with my red and yellow bell peppers. Thanks for the ideas for more veggies. I also love the Mediterranean Diet which includes breads fruits and vegetables, but like the wise Orientals we should eat less meat, etc. I will try some zucchini with my Shrimp Scampi and also some Pad Thai. Absolutely amazing recipe! My husband love it and wants me to do it again. Very quick to do and also very tasty. Tried it tonight subbed broccoli for zucchini and added more garlic ,bean sprouts and edamame. Hi! I want to make this soon – but the only “mein” noodles I can find in the international section of any of the grocery stores in my area (Publix, Kroger, Fresh Market) are very thin and don’t look like yours – will the thin ones be as good or what do you recommend!? Thanks! I’ve looked for lo mein noodles everywhere and can’t find them! What would you recommend as a substitute? Hi Emily. Did you check the ethnic aisle in the grocery store? You could sub in linguini pasta, but adjust the cook time (I’d say add 2-3 minutes). I pinned your Sriracha recipe a while back and finally gave it a try with spicy sausage as we did not have shrimp. My family and I loved it!! This will be repeated. Thank you for sharing. Hi Deborah! Thank you so much for making my recipe and letting me know you enjoyed it 🙂 I LOVE the idea of using spicy sausage here – trying that soon. I’ve made this dish several times and it’s so tasty. I’m thinking of adding snow peas and/or shiitake mushrooms next time to give it a heartier take. Ive made this dish several times now and is by far one of my favorite Pinterest recipe I’ve made out of well over 100! I double the sauce recipe and use extra veggies since I’m a vegetarian. A must try! I’m making it for dinner tonight as a matter of fact. Thanks for posting this! i made this a couple weeks ago, when we were swimming in zucchini. Delicious! Tonight I’m making it again, subbing broccoli and mushrooms because the zucchini is finally gone. I couldn’t find lo mein noodles at my grocery store but they did have ramen (NOT the cheap 25 cent kind) and that worked fine. 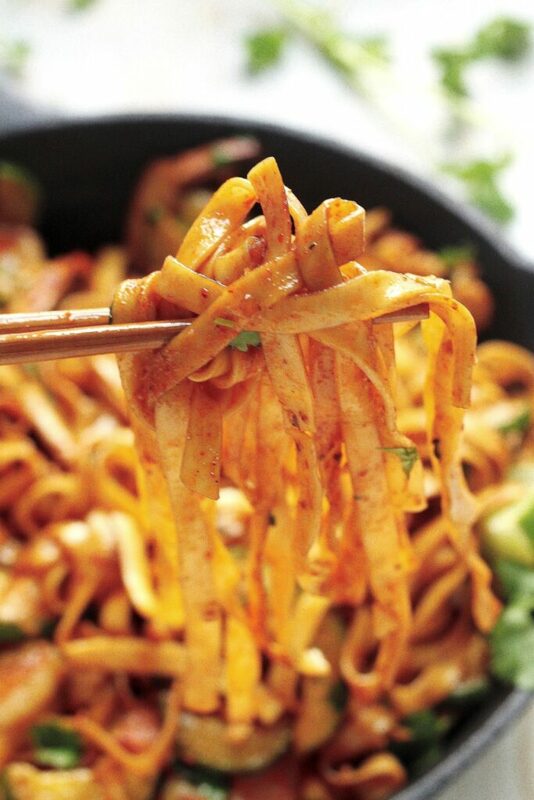 Don’t worry if you can’t find the right noodle, it’s a very flavorful and forgiving recipe! Looks absolutely delicious! How many does this serve? Hi Jo. This serves 4. Phenomenal. Can’t say enough about how good this is. I doubled the sauce because I had 1# of shrimp. Kept noodles at 8 ounces. Can’t wait to try more of your recipes. Hi! We’ve made the lo mein three or four times with no changes to the recipe and we love it! Thanks for the great recipe! That makes me so happy! Thank you for letting me know, Kanya! Made this for a family dinner with my parents. I doubled the recipe and cut back on the Sriracha. (Mom has Rosanes and lots of spicy food causes a breakout.) Once served on our plates, WOW!! This dish was a crowd pleaser. Abso-positively tasty and filling! I’m cooking dinner tonight for Mom and Dad. Mom has requested Spicy Sriracha Shrimp and Zucchini Lo Mein. You just can’t go wrong with this. It’s delicious! This was one of my first recipes on Pinterest. I just made it again with a couple of shortcuts and wow again. I think this is my favorite meal and pleases my picky family. LOVE it! Great recipe!! EXTREMELY adaptable. I used different veggies and added and subtracted some spices and it still came out great!! Though next time I might go lighter on the sugar and add more spice. Not because it was too sweet, I just love spicy food, and the spicier the better. Again great recipe, especially for those who don’t have that much time to cook (me) or hates cooking. It took me no time at all. Great tasting recipe that is very quick & easy to prepare! For more recipes and “Weight Loss Challenge Tips “please clicks on this link…. I just made this for lunch today. I added some broccoli and mushrooms and used chicken instead of shrimp. It was sooo delicious! Will definitely cook again! This is one of my favorite recipes to cook! Friends and family love it every time I make it. I like to use chicken and add shredded carrots and bean sprouts. Yum yum thank you for the recipe. Love this recipe. I adapted it somewhat by substituting the lo mein with spiralized sweet potatoes and reduced the amount of cilantro used since I am not that fond of cilantro, Took longer than twenty minutes for me but otherwise delicious recipe. Will definitely use again. Forgot to mention that I substituted yellow squash for zucchini since I had it on hand and also added 1 cup wilted fresh kale.